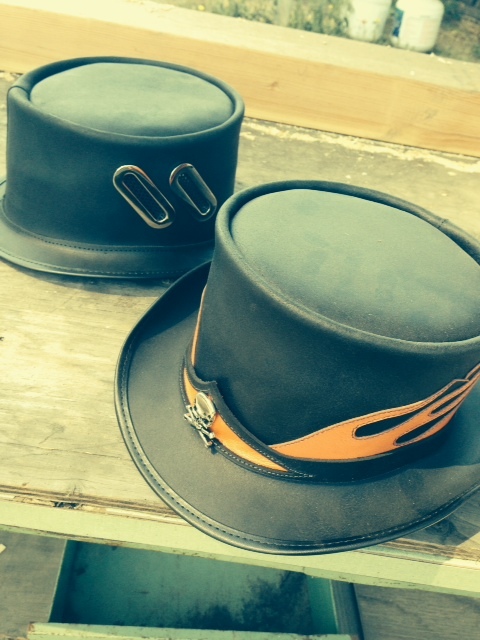 Badass leather top hats. The meek need not apply. 19th century style infused with fierce sensibility and a touch of dark energy make our Voodoo Top Hats essential to your subversive lifestyle. From hard-kicking rocker to brazen biker or neo-noir grifter, you will make a definitive statement wherever you go. We’ve designed these bad boys to be the kind of hats you can become known for wearing. Formed out of black or brown full-grain smooth leather, our toppers are built to last. Handmade with attention to quality and a discerning eye on the details, each piece is as much an individual statement as it is a cover for your head. 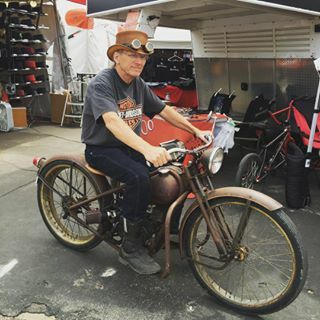 American Hat Makers is getting ready for the 76th Annual Sturgis Motorcycle Rally in South Dakota August 8-14. 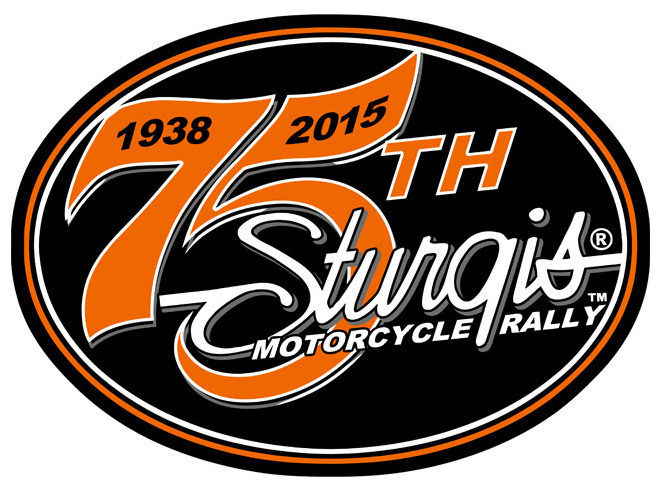 Sturgis has approximately 6,700 residents, but each year the population nearly doubles that of the entire state! American Hat Makers will be featuring the Voodoo Hatter line come check us out at the corner of Main and Junction! This year we have more of our unique and eye-catching hats and gear like steampunk goggles, belts, and bags. Of course, we will be showcasing our full line of artisan, hand-crafted, Made in the USA hats. find your next favorite hat! 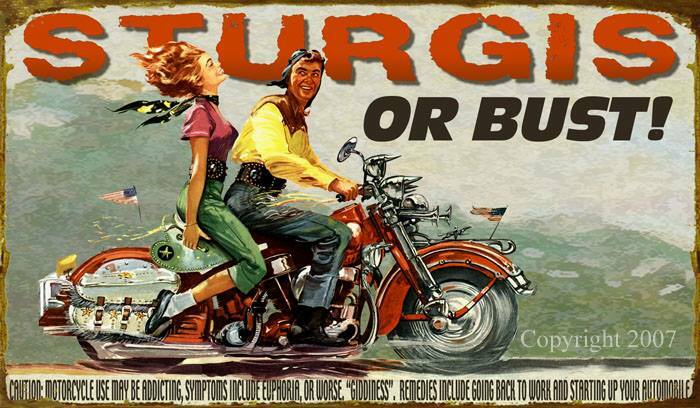 Don’t be shy, you’re at Sturgis! Written by Jessica Johnson for American Hat Makers. Garth Watrous sums it up, “Our Voodoo Hatter brand is spreading like wildfire! We are now the official hat in the motorcycle industry. 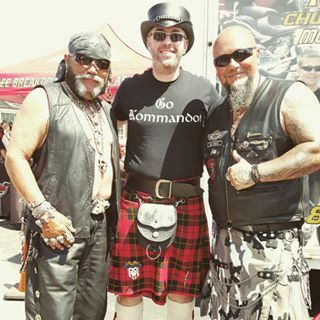 We’re always looking for new partnerships with the leaders in the industry, like Indian Motorcycles, and Harley Davidson. This kind of event put us in an optimal position for exposure, and our customers love our hats”. Hat shipment ready to go. Selling 2000 hats in 10 days requires some preparation. Bikers were pouring in days before the official event began and we were ready. We cranked up production a month in advance, fabricating (by hand) over a thousand hats in addition to our usual customer orders. 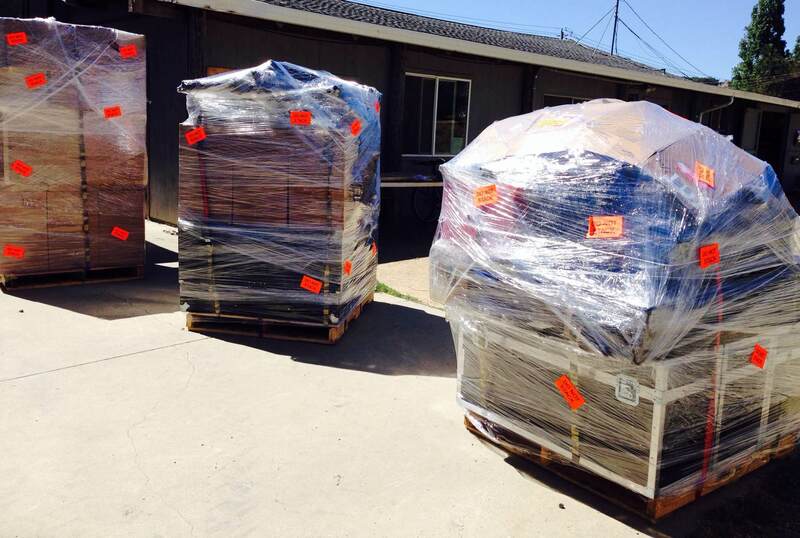 Those hats were packed on pallets and strategically shipped to our booth in two separate shipments. 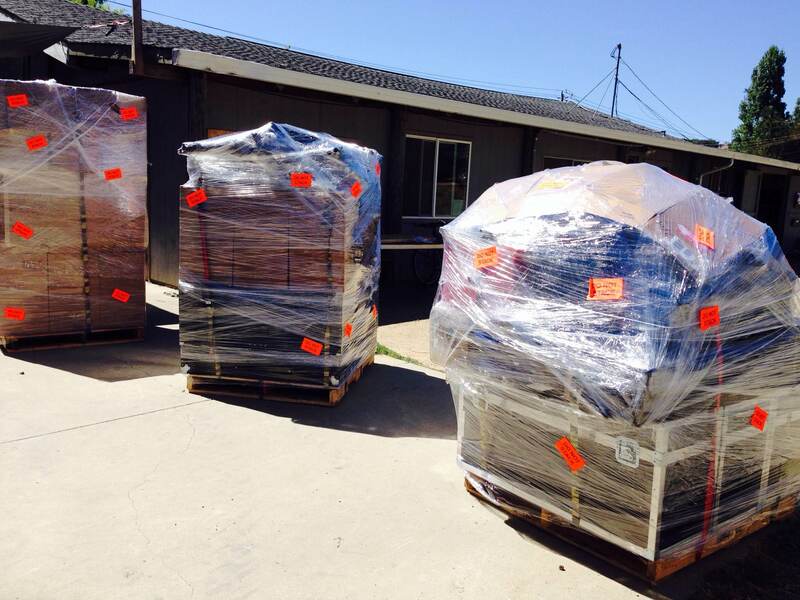 Our goal to make supply meet demand is our highest priority. Here we are on Main and Junction. VooDoo Hatter headquarters was located at the corner of Main Street and Junction Avenue, in front of JJ Davenport’s restaurant, and close to the Sturgis Motorcycle Museum & Hall of Fame. This is a prime location on the main drag! Diego En Fuego Gomes on stage with his band at the “Buffalo Chip”. It’s such a good feeling to get product recognition from people who are at the top of their trade”, says Garth. 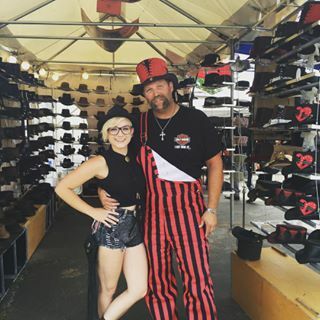 “I actually had the honor of signing an autograph for being the Owner of VooDoo Hatter. It really makes us feel good about our hats”. 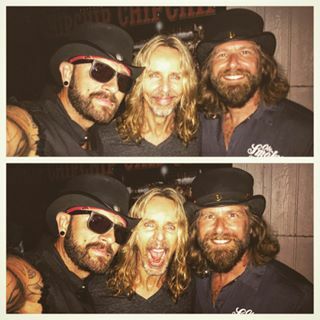 Tommy Shaw of “Styx” gives his approval. 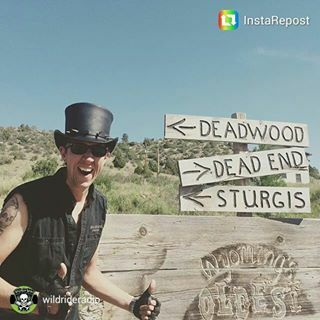 Dallas Hageman at Wild Ride Radio loves his VooDoo Topper. 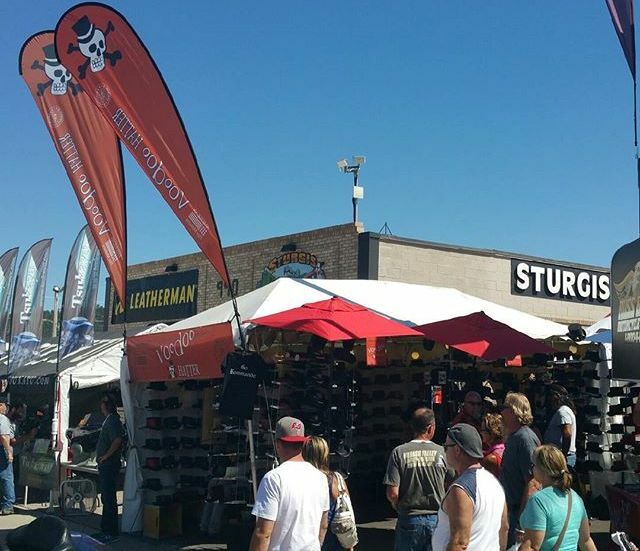 We go to Sturgis with the goal of becoming the #1 hat maker in the industry. Next year, VooDoo Hatter will be in the same location, and we’re bringing it! We’ll have new hat designs and of course plenty of the old school classics. We want to thank our customers, and give heartfelt high fives to everyone who participated in making this event a success. Here are some of our favorites. For more pictures Click here. 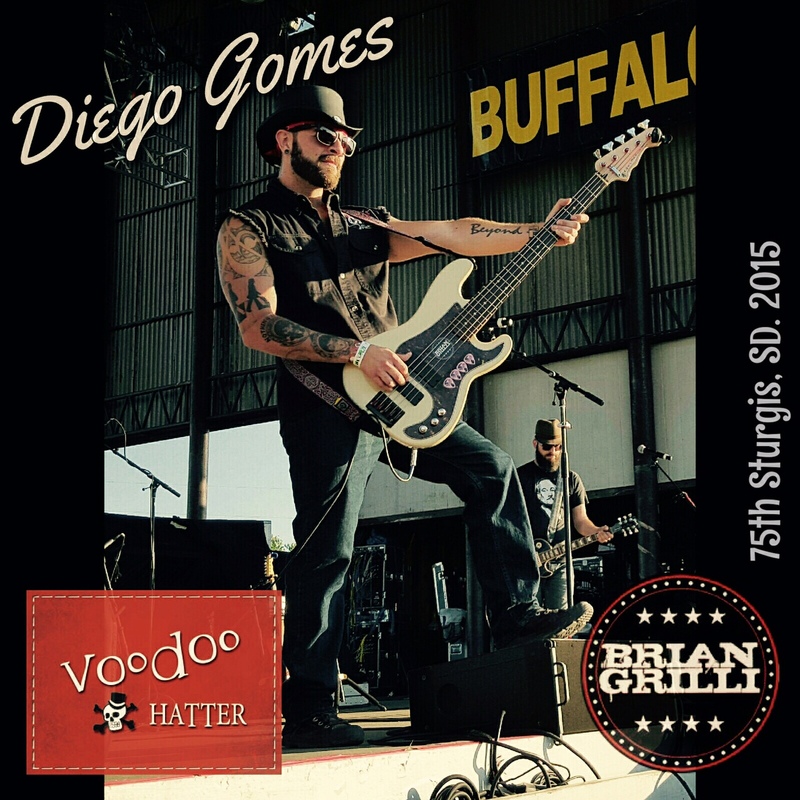 VoodooHatter is stoked to participate for the first time at the Sturgis Motorcycle Rally (the largest in the world!) in South Dakota from 29 July – 10 August. 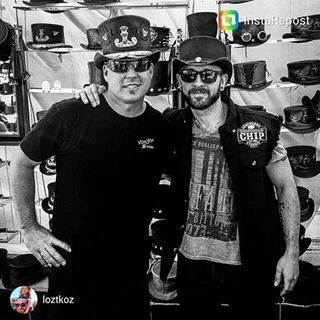 We are going to join over 400,000 motorcycle lovers and show them how awesome our leather hats are. 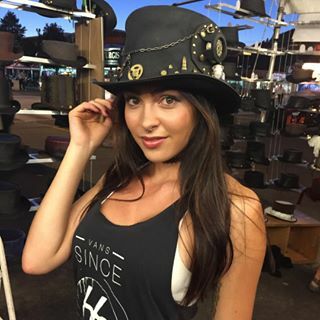 We’ll be offering all our brands — Voodoo Hatter, Steampunk Hatter, Ashbury Hats, SolAir Hats and Double G Hats – whatever mood you are in, we have a hat for that! We are super excited to showcase our Voodoo Vented Top Hat and Flame Top Hat – come on down and get your pic taken with these hot hats! 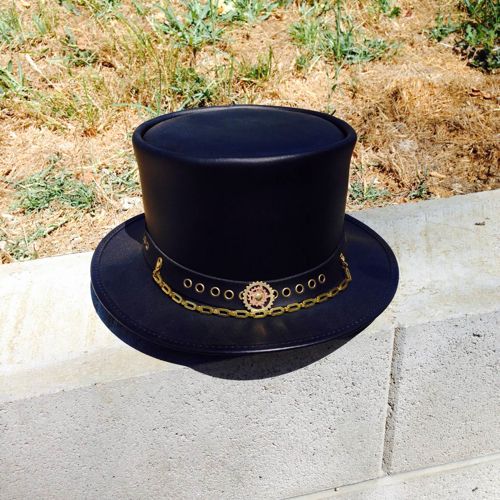 Lucky attendees will also get to preview FIVE new hats from our extensive collection of handmade leather toppers. We’ll also have leather keychains and Voodoo Hatter tshirts – deck yourself out in style. 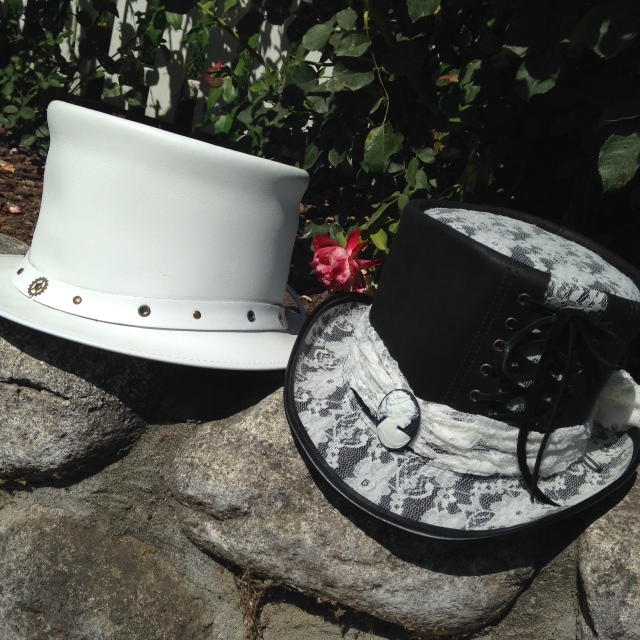 Whether you are wanting to get married (our Steampunk Hatter Havisham is perfect for the blushing bride — our Voodoo Hatter Topper would be fly for a groom), or just want to look cool on your ride, visit us at the corner of Main and Junction – 29 July to 11 Aug.
AND…we are giving away a FREE hat, too! Like Voodoo Hatter on Facebook, Twitter or Instragram, tag a photo of yourself – use the hashtags #1800NiceHat and #VoodooHatter. Double points if you get Jesse James or Lance Armstrong in the photo – TRIPLE if they are wearing an American Hat Makers hat!